Next, we report on the downside of a bidding war for Amazon. Many cities are competing to be the chosen one, the site for a second Amazon headquarters and 50,000 promised jobs. At the same time, some politicians ask if cities are being played. NPR's Alina Selyukh reports. ALINA SELYUKH, BYLINE: When one of the world's fastest-growing companies says we want to give your city thousands of jobs paying six figures, it's easy to understand why red carpets roll out immediately. 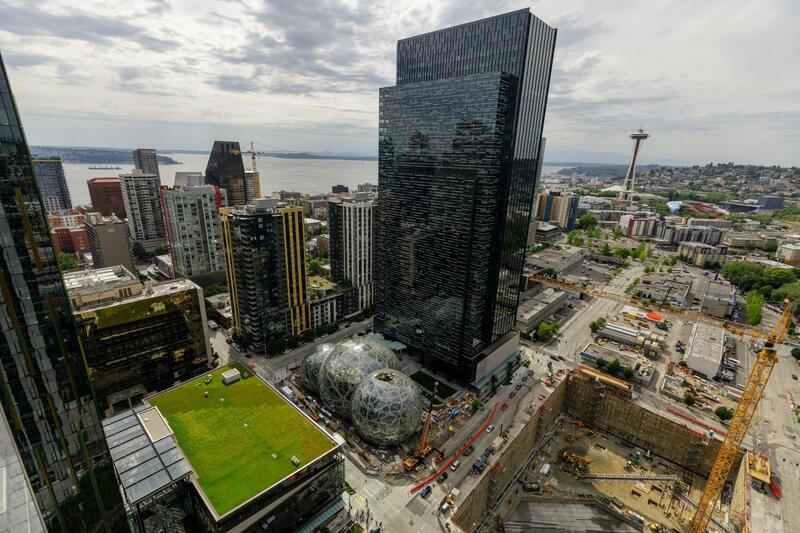 Amazon's second headquarters is such a huge moment that Washington, a state with the original Amazon HQ, is also bidding for HQ2. In Atlanta, the bidding even factored in the race for mayor. CATHY WOOLARD: I wrote a letter to Amazon as if I was making a marriage proposal and just had a few things to get off my chest. SELYUKH: Who usually calls you? SELYUKH: Greg LeRoy is the guy to call if you want to know about corporate subsidies. He runs Good Jobs First, a nonprofit watchdog group that tracks what he calls corporate welfare. LeRoy says Amazon's jobs promise is unprecedented if it materializes. And sure, if it does, a surge of wealthy residents would spend more money, boost local businesses, maybe draw in new ones, do good things for the economy. LEROY: Our concern about this deal is that states and cities are going to overspend for the deal so badly that they'll never break even. SELYUKH: And here's the thing - most economic development officials don't actually expect tax incentives to be the deciding factor. PAUL O'NEILL: I never made an investment decision based on the tax code. SELYUKH: That's the voice of Paul O'Neill, the former CEO of the industrial giant Alcoa. Here he is testifying before Congress to become the Bush administration's Treasury secretary in 2001. He was asked what tax code encourages business investment. And he says only a gambler would base a long-term plan on a tax deal. A strategy of a businessman bakes in resources and intelligence. The taxes are a cherry on top. O'NEILL: If you're giving money away, I'll take it, you know? If you want to give me inducements for something I'm going to do anyway, I'll take it. JIM DOYLE: And I often thought as governor it would be sort of nice if all of the governors just got together and said, look, we're just not going to play this anymore. SELYUKH: That's Jim Doyle. He's the former governor of Wisconsin. He was there during the financial crisis in 2008 when GM was closing down plants, including a factory in Janesville in his state. And then GM said it would reopen one plant. So Doyle put together a massive incentive package, hundreds of millions of dollars. DOYLE: In this I think GM really just played Wisconsin. SELYUKH: Because Michigan was the obvious choice, and it kept offering more. DOYLE: When I look back at it, I believe they were going to Michigan. I can understand why they were going to Michigan. They closed more plants in Michigan. But I always felt we got used just as somebody to drive the bidding up. SELYUKH: This happens all the time, says Amy Liu, who runs the Metropolitan Policy Program at the Brookings Institution. AMY LIU: There's a whole system in economic development that has pitted states and cities against each other for corporate relocations. Amazon just happens to be very good at it. SELYUKH: In fact, Amazon has already benefited from more than a billion dollars in taxpayer-funded subsidies for operations like data centers or warehouses. And we should note, Amazon is one of NPR's sponsors, but Liu has an additional worry about the nationwide race for Amazon's HQ2. LIU: It's created a major distraction from what the real day-to-day economic development activity should be. SELYUKH: And that, she says, is not chasing shiny mega deals but the long, arduous work of grooming and nurturing homegrown businesses. Alina Selyukh, NPR News, Washington. (SOUNDBITE OF YPPAH'S "I'LL HIT THE BREAKS") Transcript provided by NPR, Copyright NPR.